Babies begin to build their hand skills very early, and being able to grasp an object is the foundation for lifelong skills such as buttoning a shirt or writing with a pencil. Put a capped marker or plastic spoon in your child’s hand, then wait for him to drop it! Make sure to praise him when he drops it, then try it again! Take a look at this video to get started. Dangle a scarf, sock or colorful piece of cloth in front of your baby. Help him touch the fabric or shake it to get his attention. Encourage any movements toward the fabric by smiling and complimenting his efforts. Your positive comments encourage him to practice this skill, even though he will only kick and swat randomly at first. Make sure to keep an eye on him during this activity because scarves can present a hazard to babies. Sit at a table with your baby in your lap facing away from you. Show her an interesting object like a piece of fruit or a board book and talk about it to stimulate her interest. Place the fruit on the table and turn your baby so that she faces away from the object. Praise your baby’s efforts if she tries to turn to locate it. If she makes an effort to find the fruit, give it to her and give her a hug. Play a game using rhyming words and actions to help your baby learn to predict the future. Hold your baby on your lap while you sing a song, such as “This is the Way the Farmer Rides,” or say a rhyme, such as: Ride the horsey, ride to town. Ride the horsey, don’t fall down. Bounce your baby to the rhythm of the song or rhyme and have him follow the actions indicated in the lyrics. For example, for “Ride the Horsey”, bounce your baby and then have him “fall down” through your legs while holding on to his chest, under his arms. Repeat the rhyme and movements several times. Then, pause before having your baby “fall down”. 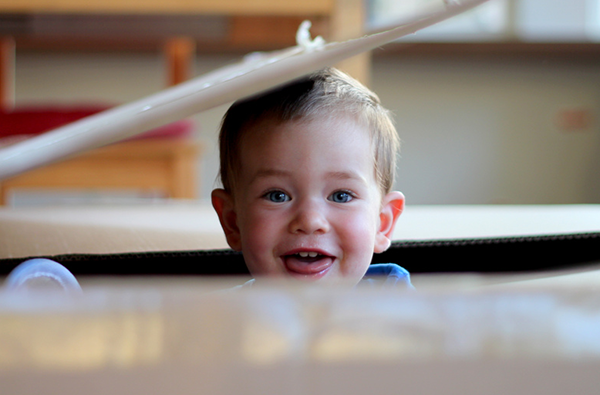 If he smiles, kicks his feet or tries to move his body down, your baby is learning to predict the future! Check out this video to watch how. For children that are on their way to toddling, here are more activities. Your child will enjoy making marks on paper with crayons or in sand with a stick. Allowing him to practice will help him become aware of out how it feels to draw while using his hands and arms. By offering positive feedback when he makes different types of lines, he will notice how it feels to make a variety of designs. Check out this video to watch how. Help your child learn to share. Rolling a ball back and forth teaches cooperation, which will prepare your child for more advanced kinds of play with other children. Sit a few feet away from each other and get rolling. Collect a variety of lids, plates and boxes that have different shapes. Sit at the table with your child on your lap, and show him how to trace one of the objects with his finger. Then, give him a crayon or pencil to trace around the object onto a piece of paper. Show him the shape that you created. Invite him to trace the line with his finger, and talk about the shape. Discuss how it matches the object that he traced. To do this activity, use string or yarn and objects with large holes. This could be shower curtain rings, bracelets, toilet paper rolls or cookie cutters. Be sure to pick items that will be safe for your child to play with, and stay close by. To start, tie one of the objects at the end of the string, and invite him to string the other objects through in whatever order he wants! Help your child hang it in his room when you’re done. Supervise this game because strings can be potentially dangerous for kids to play with. Follow along with this video to help you get started.